Although there have been complaints about the recording style adopted by Varese for their film music re-recordings, I have always enjoyed the timbre that the RSNO and the engineers have produced, even if it isn't ideally suited the kind of harsh music that composers such as Bernard Herrmann composed. However, in this case the marraige between writing and recording style could not be better. With the exception of his Bond scores, John Barry's music needs to be recorded in a warm acoustic. There is not a great need for crystalline clarity and thus Out of Africa as one of Barry's finest intimate epic scores must rank as an ideal choice. It is fair to say that a re-recording is only a partial requirement. The original album is one of the easiest scores to obtain and has sold thousands despite having rather tinny sound and being generally a little on the unsatisfactory side. This album adds unreleased score cues and only contains one track not by Barry, the Mozart clarinet adagio. The main theme starts with a shimmering string note that is then joined by the horns that results in a melody as wide as the landscape that the film depicted. This fusion of music writing style and cinema is all to rare, but the music really does conjur up images of vast and splendid vistas, just as it should. Of course, films are also about people and in this regard, the secondary theme displays a more intimate warmth, as opposed to a splendid one. This theme is generally associated with the lead character, Karen and actually appears more frequently than the main theme. In a couple of places it reminded me of You Only Live Twice, but only as a fleeting suggestion of the opening phrase. Almost every cue features one or other of the two themes and only in such cases as Karen's Journey Starts is there any kind of divergence in style. This actually features some quite dissonent music and even though it is never overtly brutal or harsh, it does provide a nice break in the lush solemnity of the rest. Any film which features long shots of scenery or sequences containing minimal dialogue are bound to have at least one highlight and Out of Africa is certainly no exception. Flight Over Africa is certainly a highlight; a noble rendition of the main theme backed with a fairly distinctive Barry choral arrangement. While not quite as repetitive as some of his other scores, it does suffer from only having a couple of major motifs a somewhat limited variation in orchestral colour. However, given that the original film is over two and a half hours long and this is the lion's share of the music written, spread over the entire running time keeping the tone consistent would have been difficult without re-introducing the themes on a regular basis. That having been said, this is still one of Barry's most popular scores, given a wonderful treatment by Joel McNeely and RSNO and so I highly recommend this version, even if it isn't the original. First of all: the CD I have chosen to review is the re-recording made by Joel McNeely and the Royal Scottish National Orchestra for Varese Sarabande. This release has more music by Barry, and is very true to the original. McNeely and the RSNO have made a superb job with this recording. 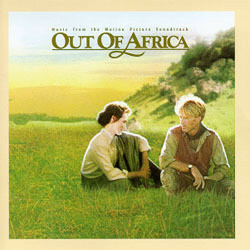 Written in traditional epic Barry style, similiar to Dances With Wolves, Somewhere in Time and The Scarlet Letter, with lyrical themes, mainly arranged for sweeping strings and soft woodwinds, and a calling horn here and there, Out of Africa is one of those scores that drifts like a gentle, and warm summer breeze. Few scores are as relaxing listening to as John Barry's wonderful score for this film, about Danish writer Karen Blixen. The romantic and a little nostalgic main theme has to be one of the most beautiful themes ever written for a motion picture. The only negative about this score is that it is perhaps a little too monotonous. A little variation would have made the CD more enjoyable listening to. The music revolves around three different themes; the famous, already mentioned main theme, best heard in tracks like "I Had a Farm and "Flight Over Africa"; a more light and optimistic, but not the less sweeping, theme, as its best in "Safari"; and finally a simple, sad theme, getting its best rendition in "Have You Got a Story for Me", where it is performed by a lonely piano. Also included is the adagio from Wolfgang Amadeus Mozart's Clarinet Concerto. As a big Mozart fan, I think that the second movement from this concerto is perhaps the most beautiful music ever composed. The piece is performed by the RSNO, with John Cushing on the clarinet, and blends actually very well with Barry's score. There's also some excellent liner notes, written by Kevin Mulhall, who analyzies Barry's music, and explains the different themes and gives us information about John Barry and conductor McNeely. Why can't all liner notes be like these?